SBB has placed the largest rolling stock order in its history, with the goal of improving its rail offering for its customers. SBB has placed the largest rolling stock order in its history, with the goal of improving its rail offering for its customers. The Swiss rail provider has commissioned Bombardier Transportation Switzerland AG to build 59 new double-deck trains for its long-distance services, a total order volume of approximately CHF 1.9 billion. The decision was taken following an extensive tender procedure governed by international agreements and Swiss legislation. But in the end, it was clear: Bombardier could provide the best product both in terms of passenger comfort and overall cost-effectiveness. 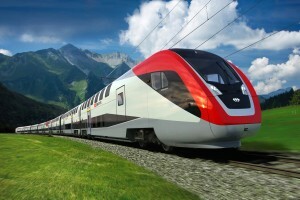 The new trains are due to be rolled out in phases from December 2013, first on InterCity services on the St. Gallen–Zurich–Berne–Geneva and Romanshorn–Zurich–Berne–Brig routes, and on InterRegio services between Zurich and Lucerne, followed by other routes throughout Switzerland. SBB is ordering a total of 436 fully air-conditioned coaches with over 36,000 seats to enhance service quality for all its customers. Bombardier’s vehicles will have the widest interiors and deliver the largest number of seats, with distances between seats equal to that in IC 2000 coaches. The new vehicles will also be “pressure-resistant”: passengers will benefit from noticeably reduced pressure waves and less pressure on their ears in long tunnels and when trains pass one another. “Objectively, Bombardier’s was the bid that best matched our specifications and offered us a very customer-friendly train,” SBB CEO Andreas Meyer told the media. Mr Meyer also stressed the cost-effectiveness of Bombardier’s bid: “Modern trains and a further improved offering will provide our customers with numerous tangible benefits. What is more the passive tilt capability of these trains will give us additional journey-time leeway throughout the network. This increases punctuality and leads to fewer missed connections. It is an important step in the continued improvement of our offering,” he said. The total investment volume, including SBB’s own contributions and development costs, is CHF 1.86 billion. The competition in the tender process and the large procurement volume have driven this figure well below the credit volume of CHF 2.1 billion originally projected. Over the next twenty years, SBB is going to need 120,000 more seats on its long-distance services: old, non-air-conditioned rolling stock must be replaced, and the company will also be increasing capacity on its long-distance services by 60,000 seats to take into account the additional demand expected. SBB’s current long-distance fleet consists of a mixture of double-deck trains, tilting trains and conventional single-deck trains, the oldest of which have been in service for over 40 years. The company will be investing an approximate total of CHF 20 billion in new and modernised rolling stock by 2030, and the funds for this must be generated entirely from SBB’s operating profits. In accordance with the applicable legal provisions, the proportion of added value generated by a bid in Switzerland cannot be one of the selection criteria. In spite of the stringent requirements, SBB is nonetheless playing a vital role as a driving force and motor for the Swiss economy: the company is not only Switzerland’s fourth biggest employer, with a headcount of 28,000, but SBB is also a key customer of Swiss industry, placing orders worth some CHF 3.5 billion in 2009. Within the applicable legislation on public procurement processes, 87% of this order volume was awarded to companies in Switzerland. Thus, SBB additionally secured the equivalent of 16,000 full-time jobs at Swiss companies in 2009. In order to make travelling quicker and easier for passengers, Lausanne and St. Gallen need to be integrated into the timetable as “full hubs” with both hourly and half-hourly timetabled connections. This means reducing the journey time between Lausanne and Berne and between Zurich und St. Gallen to less than an hour each. This desired reduction is to be achieved on the one hand through infrastructure-related measures, and on the other through the introduction of new rolling stock. The technology designed to be fitted to the new double-deck trains enables the vehicles to negotiate curves faster by tilting up to two degrees (the maximum tilt on conventional tilting trains is eight degrees). So with the trains’ passive tilt mechanisms enabling them to negotiate curves faster, journey times can be improved by around 10% without sacrificing passenger comfort. Yet the idea of incorporating a passive tilt mechanism into trains is nothing new: similar systems are already in use on Talgo trains in Spain and Shinkansen services in Japan. SBB, too, has considerable experience with passive tilt mechanisms: its own class Re460 (“Lok 2000”) locomotives also feature similar technology.